I feel like I've been sewing like crazy, but judging from my to do list in my last post, it doesn't seem like I've accomplished much! -tried on gala gown; decided on no lace at sleeves, and realized that since I haven't lost more than a pound or so, there is still a 1-2" gap ask the way down the back. I hope I can do all that! Tonight, I took a look at how the skirt for my gala gown needs to be finished at the waist, and I'm so confused. 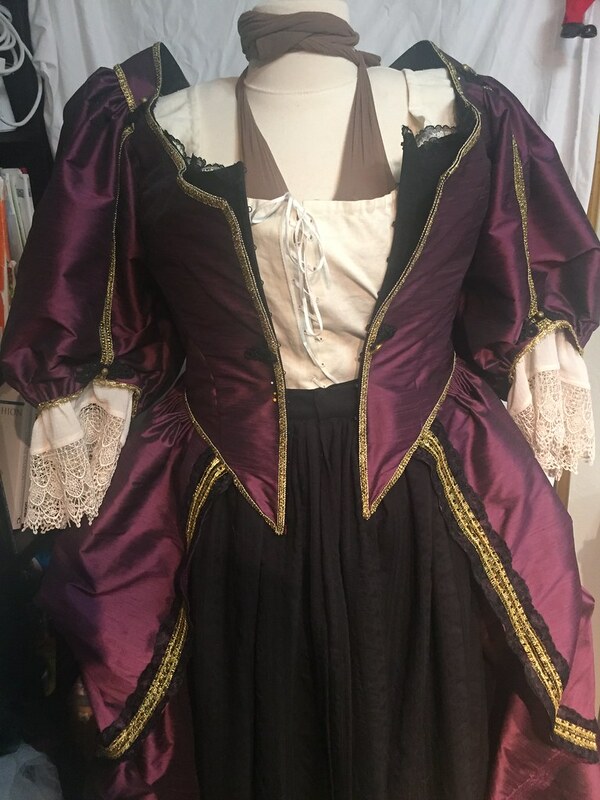 The last time I made 1660s, I attached the skirt to the waist in the back, but I can't do that with this one. When I made it up, I had put the opening in the back, but trying to study Kendra's, it looks like she still has the ties on the sides. Am I supposed to line up where the openings go with the placement of the center-most bodice tabs? And if so, does that front panel wind up just being flat? Help! The trimming is done on the bodice. Not including the sleeves, though, since I haven't actually cut those out yet. Luckily, I have the next two days off, with very little to do besides apartment hunting, an audition, and opening night on Friday. Oh, and I didn't get the apartment. Which means I now have 15 days total to find an apartment and finish moving... I'm getting really worried here! So in between all the major stressing going on in my life with the whole apt hunting thing, I have found time to do a bit of handsewing. I've bound the top edge of my gala bodice, applied a row of lace down the sides of the center front, and have started attaching the wide lace "collar" (for lack of a better term) to the neckline of the bodice. Then I'll need to do the pearls in the CF, sleeves, and the skirt, and the gala gown will be done! I finally have internet again! I tried on the bodice on Sunday. 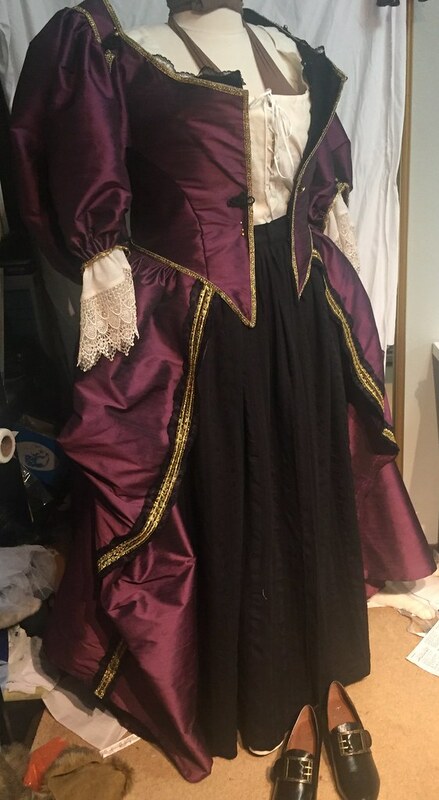 Unfortunately, I think the cotton twill that I made the boned section out of must have a lot more give than with the silk taffeta on top, because I have app. a 2" gap in my lacing. Of course, this is me lacing myself up in back spiral lacing, which I am not terrific at, so maybe I'll be able to get it closed with help. If not, I'll make a modesty panel I can shove in there. Because there's no way I'm altering the bodice. I'm also getting some pretty horrific wrinkles in the center front, but I'm going to have to ignore it, and hope that they'll be less obvious once I put the trimming on. And the back, where there were the pulls in the fabric from the eyelets. Does anyone know how to make these ugly ridges go away? PS. I love Puppy Curls! And this is testing out the trimming. I'm not in love with that pearl/lace down the center, but I have to see what else would be available to me. And the ribbon belt will be darker green. I was just playing around with what I had in the stash. At this point, I have finished all but two tabs on the binding. I've also cut out the two big skirt pieces for my mom's 50s skirt. That one is due by next Monday. And today, I started in my new store location. So far so good! I finished the front side of all the tabs on one side (aka, 5 tabs). I haven't tried on the bodice yet, since I realized the inside of those tabs is filled with pins! So my goal for tomorrow, when I don't have rehearsal, is to finish the insides of those tabs, and then try it on. Even though it makes me really nervous that it won't fit for some reason. Or that it will be filled with terrible wrinkles and pulls, which is what it seems like now. For all of you who have done bodices or stays out of silk taffeta before, should I have been expecting a horizontal pull line in the fabric next to every eyelet? Because that is what happened. :( I'm just hoping no one will notice! I do deliver once in a while. Here are the pictures from last week of the boned part of the bodice. It is now looking quite different, and quite orange! This morning, I ripped out all the stitching I did from when I was going to put right sides together and turn. Then I re-sewed the tops of the boning channels, and started on my eyelets. Ugh. I am such a slow hand-sewer! I've done 16 eyelets so far, out of 24 total. Hopefully I'll finish tomorrow night, and then I have all the binding to do. The one good thing about hand-sewing is I have plenty to do when I'm offstage during rehearsal! It's all steel boning, and I really do like the shape it gives me! So thanks to nuranar, I have now realized I have six weekends left till CosCol, minus one when my parents are coming up to visit. Most of that time I will be in rehearsals/tech/performances for Gondoliers, plus working full time. Aaahhh!!! 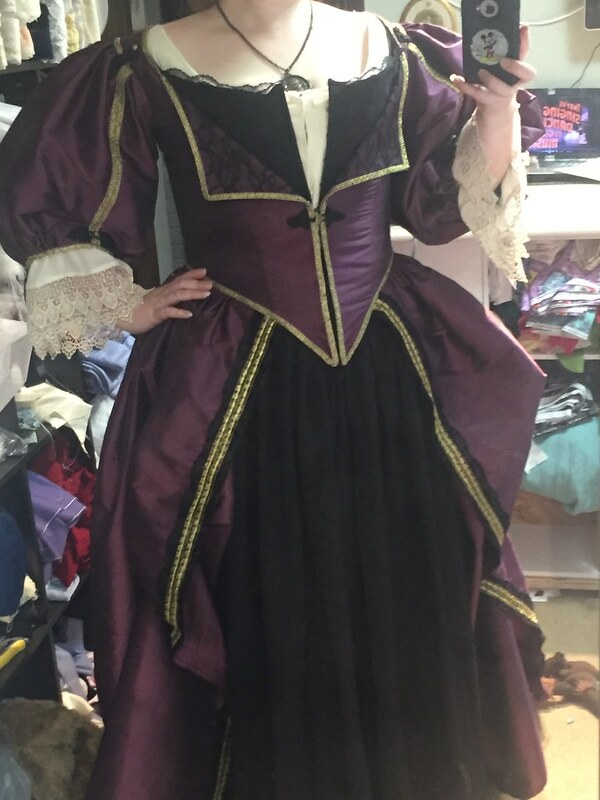 Yesterday, I patterned and made a mock-up of my new 17th c gown. I'm having a hard time dating my inspiration portrait, but I think it's dating to maybe the 1630s or 40s? I don't like that silhouette as much, so I think my interpretation is more like early 1660s. I'm using the pattern from Janet Arnold, and making a fully boned bodice. I'm hoping to get away with doing the Janet Arnold pattern for the boned part, too, though I know it's supposed to be a different shape. I just don't want to have to deal with the two different patterns potentially fitting differently! In any case, I tried my mockup on over my 1780s stays, so I knew what shape it was trying to be, and the fit was almost perfect. I'm adding about .5" to each side panel because I know it will get a little smaller after I put the bones in (I'm primarily using 1/4" steel). And I think I'm going to cut the front bottom shape in a steeper v, because it's looking oddly wide at the sides. The tabs will also come up a little higher. Here's a couple pictures. I think all the wrinkling at the waist in front will go away when I have stronger boning in the front (my stays have really conformed to my shape, and curve out below the waist). It's only been over six months since I last added a post to my blog, but I finally wrote another one tonight! 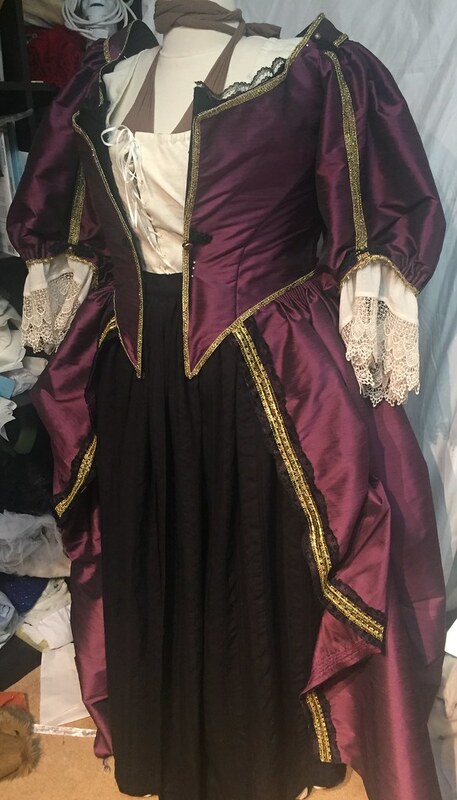 It's nothing new for those of you who have been reading my lj since the beginning, but if you haven't seen my Restoration gown from 2011, go check it out! And in other news, are there any group plans going around for CosCol? I know people were thinking of doing Curtain-along for one event, and Riding Habits and Redingotes for another, but have they been specified yet? Also, is anyone else joining theladysarah and I at Disneyland on the Tues and/or Wed before CosCol? I finished the cloak! I'm really happy with it. I'm sure I'll post pictures eventually. And I cut out the shoulder strap pieces for the two bodices. 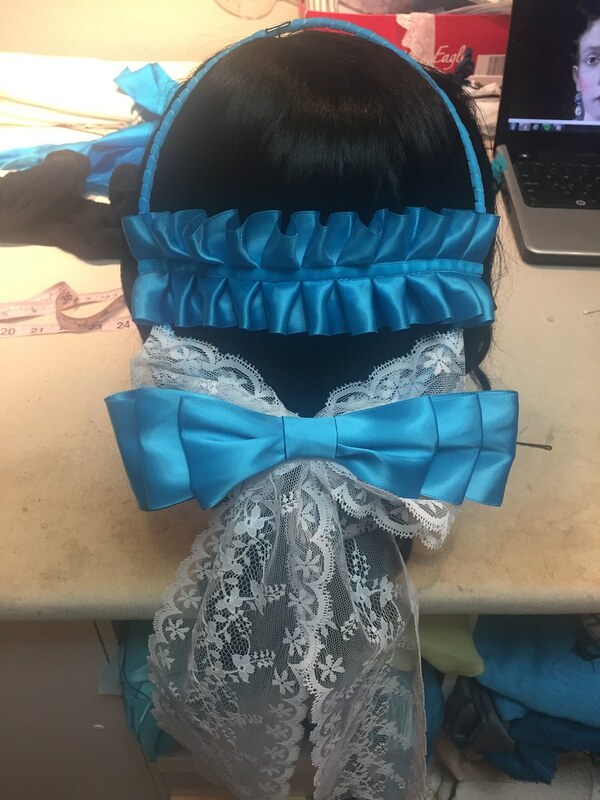 I have to attach them, attach the underbodice sleeves, figure out the pattern for the overbodice sleeves, make those, and hem the robe and the petticoat. And I'm wearing this all in less than a week. Ahhhh!!!! Otherwise, maybe I'll just settle for poly taffeta.